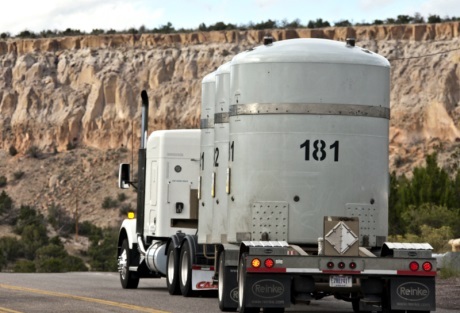 Waste from the Los Alamos National Laboratory (LANL) in New Mexico will be temporarily stored at a site in Texas until the Waste Isolation Pilot Plant (WIPP) disposal facility reopens. LANL has committed to remove all above-ground transuranic waste from its site by June. In early 2012, the US Department of Energy’s (DoE’s) LANL signed an agreement with the Governor of New Mexico to remove all above-ground transuranic (TRU) waste and ship it to WIPP by June 2014. A $200 million contract was awarded to a partnership between EnergySolutions and Environmental Dimensions Inc (EDI), with various subcontractors, to carry out waste characterization, processing and waste operations services. TRU is waste containing man-made elements that are heavier than uranium, such as plutonium. The waste consists of such things as contaminated clothing, tools and other work equipment, rags, soil, and debris from the laboratory’s technical sites, arising from LANL’s operations since its foundation in 1943 as part of the Manhattan Project. However, operations at the WIPP facility were suspended following the detection of airborne radiation within the plant on 14 February. The WIPP plant, located almost 500 kilometers from LANL, is owned by DoE and operated by Nuclear Waste Partnership LLC (NWP). The facility disposes of transuranic waste packages from the US military in an underground salt formation. In order to help LANL meet its commitment to remove the TRU from its site by June, NWP has signed a contract with Waste Control Specialists for the temporary storage of the remaining waste at its facility in Andrews County, Texas. Workers are expected to re-enter the WIPP facility for the first time within the next few weeks. They have been performing trial runs in a nearby potash mine. This training has allowed them to test equipment and protective wear in ground conditions similar to WIPP’s layered salt formation.